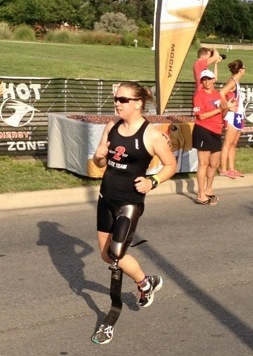 On Monday, I competed in the most important race of my life as a triathlete thus far—the Paratriathlon National Championship at the Capital of Texas Tri. It was an amazing day and an experience that I will remember forever. On race morning I woke up at 4:30 to get my oatmeal and coffee before heading to the transition area to set up at 5:30. 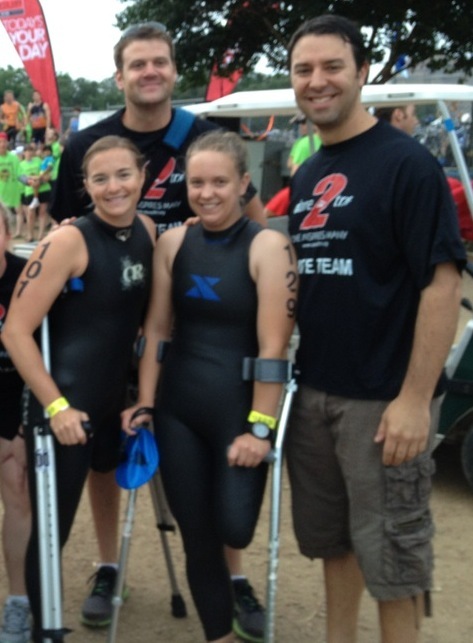 Dave, the world’s greatest prosthetist was there to help me during my transitions from swim to bike and bike to run. In addition to making some last minute modifications to my running socket to make it more comfortable, he also did a great job of keeping me calm and grounded. When I expressed any kind of concern about how the race would go he told me not to worry about anyone else, that this was my race, and that what will be will be. He reminded me to just take it all in and enjoy the awesomeness of the day. And that is exactly what I did. I remained chill up until 7am when I entered the water for my wave’s start. And when the gun went off, I just went for it. I’m happy to say that everything came together just the way I hoped. I met all of the benchmarks that I had mentally set for myself, and stayed right on track to finish where I wanted to. The swim and bike both went well, aside from the fact that I spent the entire bike thinking about how much I had to pee. By the time I started on the run, I had pretty much forgotten about how much my bladder hurt, instead focusing all my energy on finishing this thing as fast as I could. I’m glad that I had practiced the bike-run transition for the past month, as my leg felt strong as I went from one motion to the next. The Paratriathlon Championship wave went off fifteen minutes after the pros and well before the rest of the age-groupers, so for most of the race, we had the course to ourselves. The support out on the course was absolutely incredible. 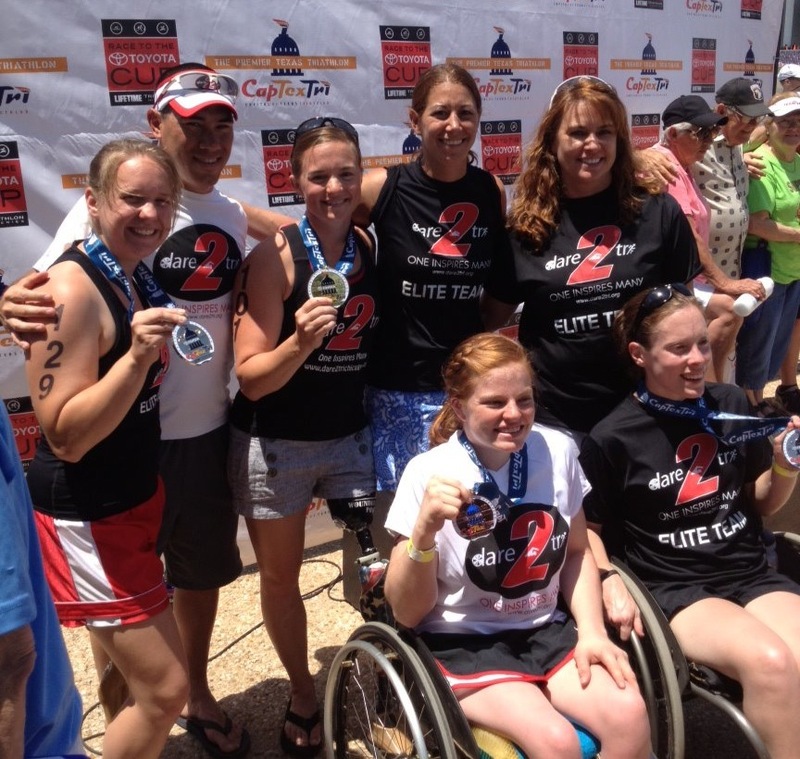 All of the paratriathletes were so encouraging, shouting words of support as we saw each other go by. I even received some “good jobs” from the pros as they ran past me. 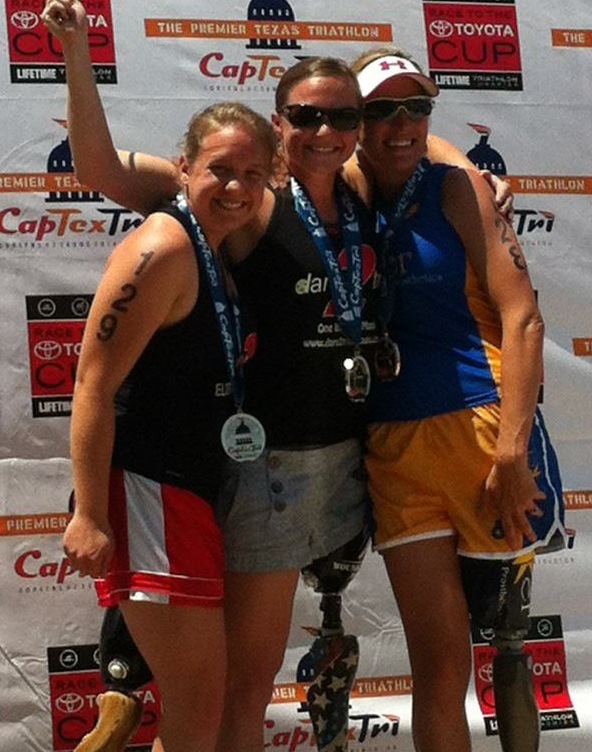 It was a great reminder that the triathlon community—both physically challenged and able-bodied—is seriously awesome. Melissa ended being the first TRI-2 to cross the finish line, and in doing so, defended her title as USA national champion. She had a great race that reflected the hard work that she put in all winter long, and I honestly couldn’t be happier for her. I was fortunate enough to be the second TRI-2 to finish, setting a new personal record and earning a silver medal. A few minutes later, we watched my Chicago girls come though in what had to be the closest wheelchair finish of all-time. We then congratulated the third TRI-2 as she sprinted through the end with a huge smile on her face. The finish line was an incredible place, where everyone was celebrated. All the while, all I could think of was how lucky I was to be there. A few hours later, we all gathered for the awards ceremony. Hearing the announcer call my name as I stood on the podium was so surreal. I don’t think I fully realized the gravity of it all until that moment, and I did my best to take it all in. After we received our medals, Melissa told both Jen and I to step onto the top podium with her as the crowd snapped photos. A small gesture, but a huge testament to her character. I am so lucky to be in the same class as Melissa, who is not only one of the most talented athletes in the sport, but also the most gracious competitor out there. Because I went under two hours and placed in the top three of my class, I qualified to go to the World Championship in New Zealand this October. I am not going to say that I am officially going just yet, as it is ultimately going to come down to funding. But regardless of what happens, just knowing that I have nailed a chance to compete on the world stage ten months after my first triathlon is enough for me. Needless to say, my first national championship was a success. I did what I set out to do and had a blast in the process. I met some awesome athletes, created some great memories, and was inspired by the community that this sport has created. Special shout outs are in order for Keri for being the transition area guru; Stacee for all the helpful race tips; Dan for the ab workout I got from laughing; Chip for helping me build my bike; the Callahans for their impressive photography skills; my teammates for continuing to inspire me; and all my friends and family back home for your words of support. I am thankful for all of you, and can’t wait to see where we go from here. Previous PostRace EveNext PostHello Summer! Congrats Hailey… you are truly amazing! Hailey…you are amazing! What an inspiration you are…congratulations!!! We are all very proud of you! Looking forward to more laughs! HAILEY!!!!! holy cow. Congrats! I suppose I shouldn’t be surprised– I knew you had it in ya, but just wow. Wow. World Championships!??! New Zealand?!?! I am truly inspired by you Hailey. Truly inspired. Congrats! Let’s get a drink to celebrate soon! Congratulations Hailey. You’ve made amazing progress in such a short time! And where you go from here is New Zealand. You score a study abroad program thru NU or you put school on hold for a semester. But if your parents yell, it wasn’t my idea. Seriously, almost exactly a year ago you seemed petrified by the idea of a triathlon, and now your next biggest adventure awaits. I’m very fortunate to know you and look forward to seeing you progress in so many ways.